["Beauty and Reality" 8x10, available at Art Access on 9/16!] 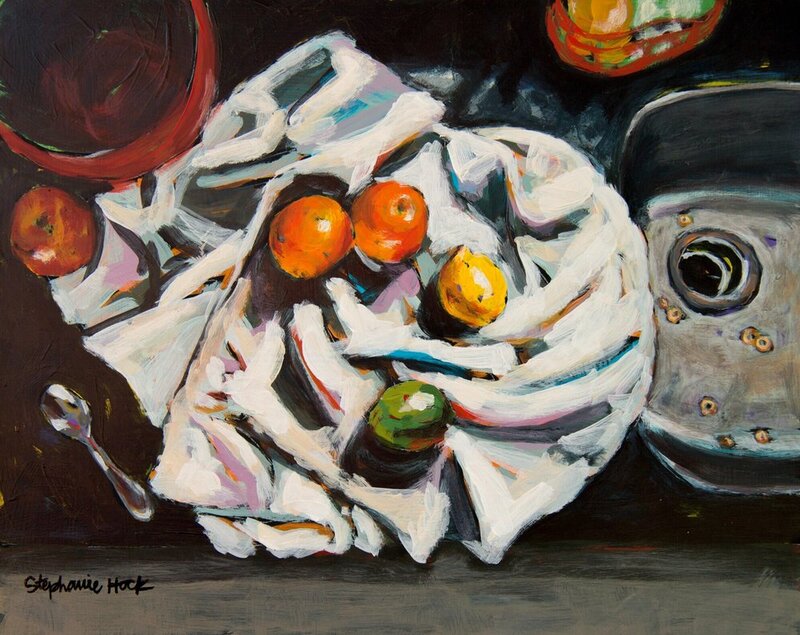 I set up this still life one day in my kitchen, bright colorful fruit on a white clean cloth that reflected so many colors in the light of my window. I photographed it from every angle and put it all away. As I was going through the photos later, I came across this one and was so struck with the juxtaposition of the beautiful still life and the zoomed out reality of Cheerios in the sink. This was a couple years ago, but this image stayed in my head, calling out to be painted. I finished this painting yesterday and am varnishing it today-- the last one to board this train before I deliver everything tomorrow. My show next week is all about finding the beautiful in ordinary, small moments. And I feel like this painting says so much of what I want to say. There are things that are beautiful innately-- maybe staged, maybe natural-- that we're always happy to show and share. And there's a lot of ordinary-- maybe a couple Cheerios, maybe a whole mess of life-- that we wish we could sweep under a rug. But we are bigger than either one of these pieces independently. We are real, we are all of our parts. And I believe, the whole package, the whole zoomed out picture is what makes life the most beautiful of all.